We have a race condition between click_link and reload_page. Sometimes the AJAX call will go through before Capybara reloads the page, and sometimes it won’t. This kind of nondeterministic test can be very difficult to debug, so I added a little helper. The helper uses the jQuery.active variable, which tracks the number of active AJAX requests. When it’s 0, there are no active AJAX requests, meaning all of the requests have completed. wait_for_ajax # This is new! Now there’s no race condition: Capybara will wait for the AJAX friend request to complete before reloading the page. This solution can hide a bad user experience. We’re not making any DOM changes on AJAX success, meaning Capybara can’t automatically detect when the AJAX completes. If Capybara can’t see it, neither can our users. Depending on your application, this might be OK. There is no official documentation on jQuery.active, since it’s an internal variable, but this Stack Overflow answer is helpful. To see how we require all files in spec/support, read through our spec_helper template. Thanks to Jorge Dias and Ancor Cruz on Coderwall for the original and refactored helper implementations. Want to level up your testing game? 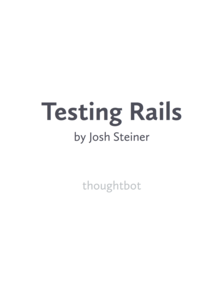 Learn about testing Rails applications and TDD in our new book Testing Rails. The book covers each type of test in depth, intermediate testing concepts, and anti-patterns that trip up even intermediate developers.